Home › Price trends › Real estate bubble leaving leftovers or Christmas presents for homebuyers? Real estate bubble leaving leftovers or Christmas presents for homebuyers? 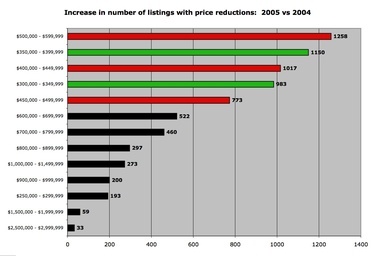 This chart, the first of five documenting price reductions in the Boston Globe’s feature story, ranks the increase in markdowns by price range for 2005 versus 2004 (click on image for larger view). the most price reductions or "Christmas presents" this year. $400,000 (shown in GREEN). Note, these are increases over last year not that total number of markdowns in each price range. All figures are through November 24, or roughly Thanksgiving, both years and are based on data from MLS Property Information Network, the multiple listings service covering nearly all of Massachusetts. Some homebuyers see prices reductions and expired listings as stale leftovers, others see them as money-saving opportunities. What’s your take? You can post your comment here, or call our podcast line — 617-876-2117 — to record your own sound bite.